A simple string of light bulbs, Untitled (Petit Palais) rejects the monumental and heroic in favor of a quietly personal approach. The sculpture was inspired by lights Felix Gonzalez- Torres saw on Paris streets, and its title comes from the name of a Paris hotel. Made of everyday objects, it is designed to suggest a wide range of meanings, incorporating both the artist's and the viewer's responses and memories and reflecting upon the poignant tension between light's capacity for revelation and transcendence and its inevitable dimming over time. The modest and open-ended quality of the piece is reinforced by the fact that it has no fixed form of its own: the artist stipulated that whoever installed the work was to choose its configuration. 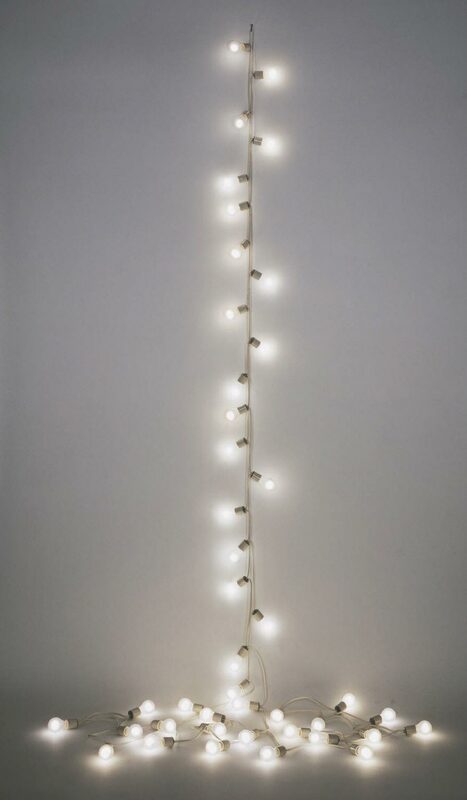 A simple string of everyday lightbulbs, Felix Gonzalez-Torres’s sculpture rejects a monumental or heroic tone in favor of a quietly personal and elegiac approach. Inspired by Paris streetlights and named after one of the city’s historic buildings, it is designed to suggest a wide range of meanings, incorporating both the artist’s and the viewer’s responses and memories, as well as the poignant tension between light’s capacity for revelation and transcendence and its inevitable dimming over time. The sculpture’s open-ended quality is reinforced by the artist’s stipulation that its configuration may change each time it is installed. Adelina Vlas, from Philadelphia Museum of Art: Handbook. Philadelphia: Philadelphia Museum of Art, 2014, pp. 404–405. The modesty and open-ended quality of Felix Gonzalez-Torres's work have set the tone and direction of much significant art created in the 1990s. Like other examples of the work he created during his tragically short life, Untitled (Petit Palais) rejects a monumental and heroic tone in favor of a quietly personal approach. The artist identified his inspiration for this series as the delicate, decorative strands of light that graced an ordinary street fair in Paris. He inaugurated the light strands in 1991, the year that his companion died of AIDS. 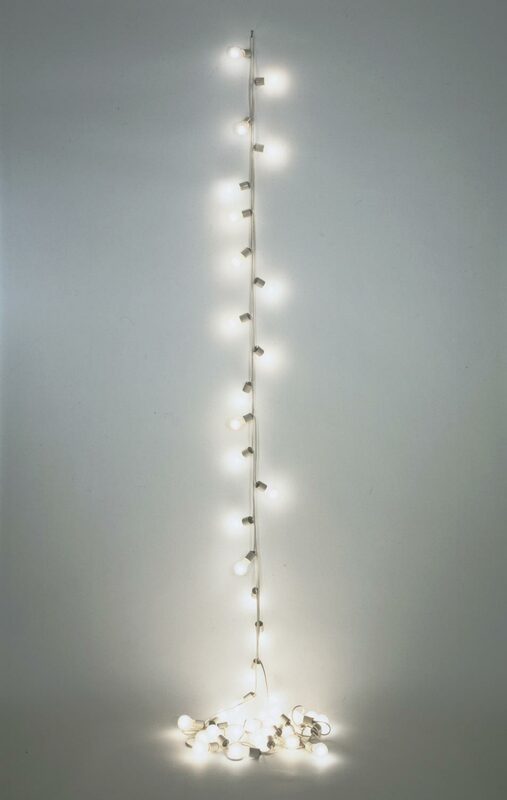 This example, comprised of forty-two frosted lightbulbs distributed on a 62-foot cord, is one of a group of twenty-four light strings that differ from one another in the titles given them by the artist and in the number and wattage of the bulbs themselves. Each sculpture can be arranged in any way a particular installer wishes, and thus holds the potential for unlimited variations. Gonzalez-Torres's persistent ambition to link private or sociocultural associations to neutral objects was a subcurrent throughout his career. Untitled (Petit Palais) is therefore designed to admit a wide range of meanings, incorporating both the artist's and the viewer's responses and memories as well as the poignant tension between the capacity of light for revelation, purity, and transcendence and its inevitable dimming over time. Although the simplicity, anonymity, and serial nature of the light strands recall the formal structures and procedures of Minimalism, they are distinguished from that movement by their deeply expressive resonance. Twentieth Century Painting and Sculpture in the Philadelphia Museum of Art (2000), p. 146.